The recent data is interesting as we are beginning to see a degree of consistency in the key market parameters we are seeking to benchmark. 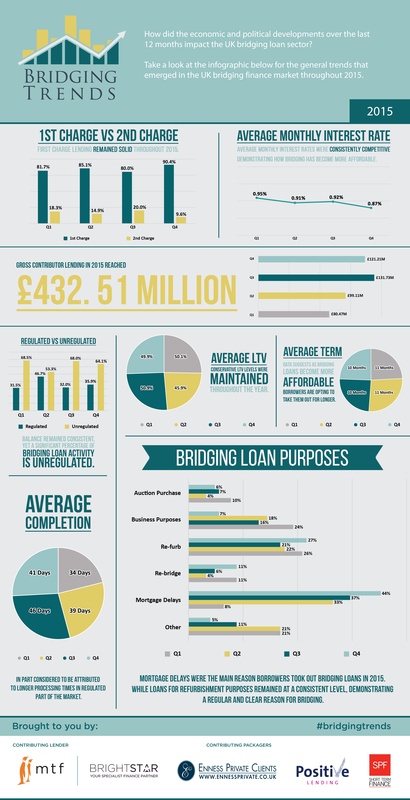 The final figures for 2015 show strong demand for bridging loans. A larger volume of completions in the second half possibly reflects a rebound from an earlier slowdown in the build up to the General Election and the quieter summer months. Interest rates were under consistent downward pressure throughout the year as the bridging sector continued to be highly competitive, whilst at the same time displaying high levels of liquidity. It will be interesting to see if a future increase in the Base Rate will impact the interest rates charged in the bridging market. The average term of a bridging loan suggests that bridging finance has become more affordable, making it more financially viable to use this type of funding over a longer period of time. The report makes interesting reading, particularly the average interest rate reduction in Q4. Our regulated business is higher than the average on the report and in the regulated world the average rate to customers has remained static and we have reached more customers with incentives such as free up front valuations, paid for by Positive Lending. The report would suggest that now we are starting to see rates reduced in the unregulated market too which has spiked an upsurge of unregulated completions. This is particularly pleasing and I would assume that as rates reduce across both spectrums of lending bridging activity will continue to increase. This is vitally important too as the unregulated market will see challenges in SDLT from HMRC which will have an impact on landlords’ residual deposits for investment purchases. Regardless of circumstance, increased competition in the sector and its resultant downward pressure on pricing is great news for would-be borrowers. We do live in extraordinary times yet it wasn’t that long ago that I remember placing residential 5 year fixes at 7.99%. The speed that deals can be put together and the quantity of equity-rich clients out there should see the sector continue to shake off its ‘solution of last resort’ reputation. With only a small handful of bridging lenders left in the 2nd charge market, I’m not surprised that 1st charge bridging continued to dominate. For the same reason, no surprise that Q4 saw a drop in the number of 2nd charge bridging loans being written, as looming MCD regulation approaches, more and more 2nd charge lenders will stop offering this service- unless they wish to get regulated for 2ndcharge consumer loans. Rates have continued to fall slowly over the year, as increased competition pushes down margins and lenders compete aggressively, primarily in the regulated space, for the cheapest rate. Generally, bridging is considered by many to be a sub 1% per month market now. The figures for auction purchases were a surprise to me. Most auction purchases have a 28 day completion deadline and many mortgage lenders cannot get a case offered and completed in this time. Coupled with the fact that a lot of auction stock property is in need of some refurbishment, modernisation or distressed in some way. Again, mortgage lenders will not generally lend on properties needing work. This all leads to property investors using bridging finance. As less than 10% of bridging loans written were for auction, this would indicate there are an awful lot of cash-rich property investors snapping up cheap property and no reliant on any form of secured borrowing. The UK short term finance market, which continues to strive in innovation and is driven by competition and the difficulty to differentiate in an ever-growing market, bears nothing but great news for brokers and clients looking for specialist solutions which aren’t catered for on the high street- or even within the private banking fraternity. This especially holds true given that over 40% of those seeking short term finance do so due to mortgage delays. The short term finance market has become increasingly relied upon in our economy, with the intention to generally iron out initial mismatches in risk profile, pricing, and the seemingly all-important issue of timing. Because of this, I believe some borrowers still need to be educated in accepting this as an essential tool, rather than some kind of ‘sub-prime’ last resort solution, when finding the best overall long term, funding package.